No fewer than seven persons were reportedly burnt to death on Thursday after officials of the Nigeria Security and Civil Defence Corps opened fire on a commercial bus on Milikin Hill Road, Enugu. The driver reportedly refused to stop and sped away as the NSCDC men chased the bus in a Hilux van. The Enugu headquarters of the NSCDC is near New Market. It was gathered that some other agents of the security agency boarded a tricycle to join in the chase along Milikin Hill Road, which is bordered on both sides by a deep valley. Eyewitnesses told The Punch that as the commercial bus was getting to the end of the road, the civil defence officers opened fire on the vehicle, causing it to veer off the road and crash into the valley. The vehicle reportedly burst into flames instantly. Reports of the incident led to a protest by commercial bus drivers and other sympathisers, particularly natives of Ngwo town, where the passengers were reportedly heading for before they met tragic end. Some of the drivers and youths reportedly attempted to protest at the office of the NSCDC around New Market, but heavily armed operatives repelled the protesters by barricading the road leading to the office and shooting into the air. Some commercial bus drivers, who interacted with our correspondent during the protest, said the NSCDC men shot at their vehicles when they approached the building. The Punch was shown some commercial buses with shattered windscreens and glasses. A witness, who refused to identify himself, claimed that the driver of the commercial bus had refused to give the NSCDC a bribe before they started chasing the vehicle. “The incident happened because the driver refused to give them a bribe when they stopped him. They went after him, shot at the vehicle and seven people lost their lives,” he said. At the scene of the crash on Millikin Hill, the correspondent observed that the commercial bus was totally burnt. The charred remains of a passenger were trapped under the vehicle, which was lying on its back inside the valley. An official of the Federal Road Safety Corps, who was at the scene of the crash, informed our correspondent that the corpses of three passengers had been moved to an undisclosed hospital morgue. There were reports that the civil defence personnel involved in the incident had been taken into custody. But this could not be confirmed by the correspondent. A towing van was eventually brought to lift the vehicle, after which the trapped corpse was removed and put in an ambulance. The body was reportedly taken to the morgue of the Eastern Nigeria Medical Centre, Enugu. Police sources informed The Punch that a girl, said to be the sole survivor of the crash, was taken to the office of the Enugu State Commissioner of Police, Mohammed Danmallam. Danmallam, who later arrived at the protest scene, said the girl had been hospitalised and could not talk. He said investigations had commenced, adding that some suspects had been arrested. He said, “This type of thing should not be allowed; we have made arrests. Investigations have started and we are asking people who witnessed what happened to come forward to make statements. “We assure you that nobody involved would be allowed to go scot-free. This is not the type of case that can be swept under the carpet. “I learnt that they (NSCDC officials) were chasing the bus; but I don’t know for what offence. He said one person died in the incident. The Public Relations Officer of the NSCDC, Enugu State Command, Mr. Denny-Manuel Iwuchukwu, said that the bus driver “abducted” a civil defence officer who entered the vehicle to force the driver to stop for violating traffic regulations. 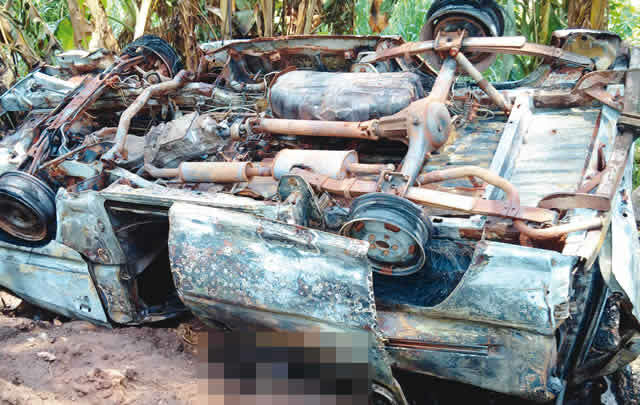 According to him, the bus fell into the valley and burst into flames while running away from the NSCDC men, who were chasing the vehicle to rescue their colleague. He said, “The state government ordered that commercial buses should no longer pick passengers outside the motor park and our men are enforcing the order. “Today, the driver picked passengers outside the park and he was asked to stop, but he refused. So, one of our men entered the bus and the driver took off with him, thereby abducting him. Iwuchukwu claimed that nobody died in the accident. Efforts to get the spokesperson for the FRSC to confirm the number of casualties were not successful. Commercial bus drivers and natives of Ngwo town were still protesting as of the time of filing this report.